Challenges - 1% Well Read, Chunksters, A to Z Titles and 100+. For a long time I have avoided this book. I thought it looked too long to read at nearly five hundred pages and I wasn't sure that the subject of geisha girls would really interest me. All I can is, how stupid was I. The word wow springs to mind when I think about this book. This book was fantastic, there is no other word to describe it. It was so beautifully written from a female perspective that it was hard to believe it had been written by a man. The story begins with a young girl called Chiyo, who with her sister, were taken away from their parents, when they were very young. Their mother was seriously ill and unable to look after them and their father knew that he would not cope, so he allowed Mr Tanaka to take away his children. How awful is that! They were taken to Gion and each deposited at a different place. Chiyo went to live at a okiya to learn how to become a geisha, where as her sister at barely thirteen was sent to be a prostitute at a brothel. Chiyo finds life extremely difficult during her first few years at the okiya and causes herself a lot of problems which result in the Mother of the okiya refusing to ever train her as a geisha. Chiyo is destined to spend the rest of her life as a maid, until a serendipidous meeting with the Chairman of an electrical company. The Chairman comes to her aid, when he sees her crying and in that moment she falls in love. Chiyo then sets out to change her fortune by finding a way with the help of Mameha, (one of the most successful geisha in Gion) to become a geisha, in order to hopefully meet the Chairman again. The book then takes you through Chiyo's change to Sayuri, an apprentice geisha and follows her on her journey to find the man that helped her so long ago. This book is a very powerful story, the journey that Sayuri takes is full of hardship and deceit, but she never gives up. Sayuri deals with her troubles and they make her a very strong character who you cannot help but love. The language is detailed and it is definitely a book that you feel you fall into and find yourself standing next to Sayuri on the streets of Gion. 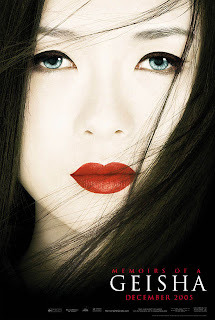 The story is constant all the way through the book with graphic details of the life of a geisha girl. It is extremely obvious that Golden carried out extensive research for this book. I would imagine that most people would believe the term 'geisha' to mean a high class prostitute, but Sayuri and Mameha were so much more than that. They entertained their clients by singing and dancing eloquently and keeping them happy with stories and jokes. They would hopefully each earn a ' danna' who they would have a relationship with and their danna would pay all their expenses, but I would not call them a prostitute, I think the word is far to harsh to describe them as that. There are parts of the book that made me a bit tearful, especially the beginning part where Chiya is taken from her family. The saddest thing about this story, is that it details a world that hardly exists now. The world of the geisha began to die out in the last part of the century and it is an exotic and eloquent world that won't be witnessed again. There wasn't anything that I did not enjoy abou this book, it was simply beautiful. If you are like me and have procrastinated over reading this book, then I strongly advise you to read it, otherwise you won't realise what you have been missing. This will definitely be in my top ten at the end of the year and one I hope to read again. Have you read this book? Or have you seen the film? I am definitely one of those who has avoided this book for much the same reasons. I've always suspected I would like it, but wasn't sure I would love it enough to make it worth my time. Glad to hear you enjoyed it so much! I didn't read the book, but I remember seeing the movie. It's been a long time, though. I do remember that I found it very touching and sad. Other cultures presented in books aren't always good reads for me but I just loved this and flew through it. However, I doubt I would have ever picked it up if it weren't for my online book group reading it. I read this before the movie came out so I had to watch it but I didn't like it quite as much. I too have been avoiding this one and I'm not even sure why. I'll have to stop being silly and pick it up! It sounds more than worth it. I'm like that also! I've been avoiding it although it's staring at me from the TBR pile... I did read quite a bit at the bookstore and remembered being captivated by the storytelling. I read this novel years ago and loved it. It's definitely one I'd like to read again. I was fascinated by the lives of these women. I wonder if the author has written anything else. I haven't checked but should. Wonderful review Viv and I'm glad you liked it also! I loved this book and enjoyed the film also. The book was so beautifully written. I had no idea about Geisha or what they had to go through to become successful. All the work and training, from the dancing to the kimonos and the hair...the makeup...etc. This book fascinated me.